Considering that the available statistics on suicide are generally based on completed suicides rather than attempted suicides, the figures may not fully capture the risk of suicidal behaviours. For example, mere exposure to suicide attempts by peers may place young people at risk of suicidal behaviour (Ho, et al., 2000). Taken together, young people can be expected to be the group at highest risk of suicide in the future. Comparing the rates and trends of youth suicide between the Eastern and Western parts of the world, several key differences have been identified in the epidemiology of suicide. 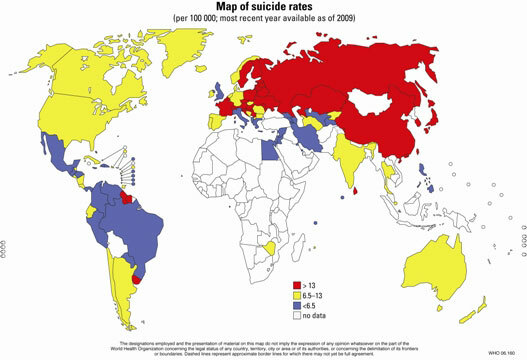 Firstly, suicide is the leading cause of death in Asian countries, whereas it is about the third or fourth cause of death in Western countries (WHO, 2010). This difference may be due to the use of more lethal suicide methods in Asia (Liu, Chen, Cheung, & Yip, 2009). In Asian countries the suicide means chosen are more lethal in nature, such as jumping and poisoning via pesticide and charcoal burning. In Western countries, firearms are the most common means of suicide. In most countries, suicide rates are higher in males than in females. This also applies to the 15 to 19 year old age group, with about 10.5 suicides per 100,000 people for males and about 4.1 per 100,000 people for females (Wasserman, Cheng, & Jiang, 2005). Gender ratios vary between countries (about 3-4:1 in European countries and 1-2:1 in Asian countries) with a high rate of suicides among young males in the West and a relatively lower rate in Asia (Yip, 2009). The causes of suicide worldwide are also diverse; with different risk factors in different cultures. Mental disorders (particularly depression) and abuse of alcohol or drugs are the major risk factors for suicide in Europe and North America. In Asian countries, impulsiveness and adjustment disorders play an important role (WHO, 2010). A risk factor that is evident across the East and West is unemployment, especially when coupled by stressful events such as financial problems and an inability to compete. Youth suicide, although responsible for only 6 to 11 per cent of all deaths globally (WHO, 2009), can still impose a non-negligible burden. Yip et al. (2005) proposed the use of a years-of-life-lost method in assessing the magnitude of the socioeconomic burden of suicide to the community. This measures the number of years of healthy life lost in the society for each premature death. 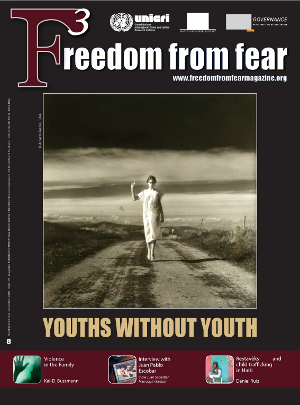 The estimated years of life lost for youth suicide worldwide are huge, about 20 million life-years in 2002 (Mann, et. al, 2005). The burden of suicide on communities cannot be ignored by any country worldwide. Yet, suicide prevention is limited without a universal perspective on mental health. A public health approach to suicide prevention has generally been advocated worldwide. As summarized by Yip (2005), a public health approach “acknowledges the importance of both the high-risk and the population-based strategies to suicide prevention, and requires a multi-sector effort to tackle the problem at multiple levels: in the community (universal strategies), among specific population subgroups (selective strategies), and among those at a particular high risk of suicidal behaviour (indicated strategies)”. Given that suicide prevention for high-risk groups would only have a modest effect on population suicide rates (Lewis, Hawton and Jones, 1997), effective intervention should be targeted at groups that show alarming trends (i.e. adopting selective strategies), and prevention in the community (i.e. adopting universal strategies). Countries in the Western Pacific region are particularly affected by suicide, accounting for 38 per cent of the world’s suicides (Yip, 2005). Hong Kong, located in this region, has experienced one of the most drastic increases in suicide rate. The suicide rate in Hong Kong increased from 12.5 per 100,000 people in 1997 to 19.6 per 100,000 people in 2003 (c.f. the world’s average suicide rate of 14.5 per 100,000 people), while the youth suicide rate has increased by more than 70 per cent since 1997 (Yip, 2005). In particular, news about young people burning charcoal or jumping from heights has aroused public attention, along with unreported cases of those at the verge of attempting suicide. To tackle the problem, suicide prevention efforts were initiated by different stakeholders (government, non-governmental organizations, academic institutions and the general public) to intervene at a number of possible avenues to suicide. These suicide preventive measures work by restricting access to lethal means of suicide in Asia (e.g. limited access to charcoal, Yip et al., 2010, and installation of platform screen doors on railway platforms, Law et al., 2009); reinforcing the social support which is an important protective factor in Asia (e.g. establishment of neighbourhood watch schemes and strengthening the community network in social support, Wong et al., 2009); and promoting responsible reporting of suicides in the media, etc. On top of these, there are school-based programme (educating students on mental health issues) and youth mentoring programme (involving youths as volunteers in mental health promotion) targeted to intervene through educational settings to enhance mental health knowledge, reduce stigmas towards mental illnesses, and foster positive attitudes towards help-seeking behaviours in young people. With the above suicide prevention efforts, the suicide rate in Hong Kong dropped significantly from 19.6 per 100,000 people in 2003 to 13.8 per 100,000 people in 2009 (CSRP, 2010). This is an example of successful suicide prevention work, in that the success of these efforts rests on the involvement and commitment of the wider community in a social and interagency network to intervene through multiple avenues to raise awareness of the problem and prevent suicide for various causes. Yet, there is still a way to go for suicide prevention to be adequately addressed worldwide. Current inadequacies and difficulties in suicide prevention that the world is facing include a lack of information on the essentials aspects of effective suicide prevention practices that can be adapted across cultures, looseness of surveillance and reporting system of suicide mortality globally, and unawareness of the importance of suicide prevention as a public health concern. Reflecting the slogan of the World Suicide Prevention Day 2010 (“Many faces, many places: Suicide prevention across the world”), it is time for the whole world to collaborate together in an integrated manner to address these inadequacies in suicide prevention as we face the challenges of an alarming trend in youth suicide. Paul Yip is the second vice-president of the International Association of Suicide Prevention and the Director of Centre for Suicide Research and Prevention at the University of Hong Kong and Ms Jenny Huen is a research co-ordinator of the Centre for Suicide research and Prevention of the University of Hong Kong. Ho, T. P., Leung, P. W. L., Hung, S. F., Lee, C. C., & Tang, C. P. (2000). The mental health of the peers of suicide completers and attempters. Journal of Child Psychology and Psychiatry, 41, 301-308. Law, C. K., Yip, P. S., Chan, W. S., Fu, K. W., Wong, P. W., & Law, Y. W. (2009). Evaluating the effectiveness of barrier installation for preventing railway suicides in Hong Kong. Journal of Affective Disorder, 114, 254-262. Lewis, G., Hawton, K., & Jones, P. (1997). Strategies for preventing suicide. British Journal Psychiatry, 171, 351-354. Mann, et al. (2005). Suicide prevention strategies: A systematic review. Journal of the American Medical Association, 294, 2064-2074. Wasserman, D., Cheng, Q., & Jiang, G. X. (2005). Global suicide rates among young people aged 15-19. World Psychiatry, 42, 114-120. Wong, P. W., Liu, P. M. L., Chan, W. S. C., Law, Y. W., Law, S. C. K., Fu, K. W., Li, H. S. H., Tso, M. K., Beautrais, A. L., Yip, P. S. (2009). An integrative suicide prevention program for visitor charcoal burning suicide and suicide pact. Suicide and Life Threatening Behaviour, 39, 82-90. World Health Organization. (2010). World Suicide Prevention Day. 10 September 2006: Many faces, many places: Suicide prevention across the world. Yip, P. S. F. (2005). A public health approach to suicide prevention. Hong Kong Journal of Psychiatry, 15, 29-31. Yip, P. S., Liu, K. Y., Law, C. K., & Law, Y. W. (2005). Social and economic burden of suicides in Hong Kong SAR. Journal of Crisis Intervention and Suicides Prevention, 26, 156-159. Yip, P. S. F., Law, C. K., Fu, K. W., Law, Y. W., Wong, P. W. C., & Xu, Y. (2010). Restricting the means of suicide by charcoal burning. The British Journal of Psychiatry, 196, 241-242.